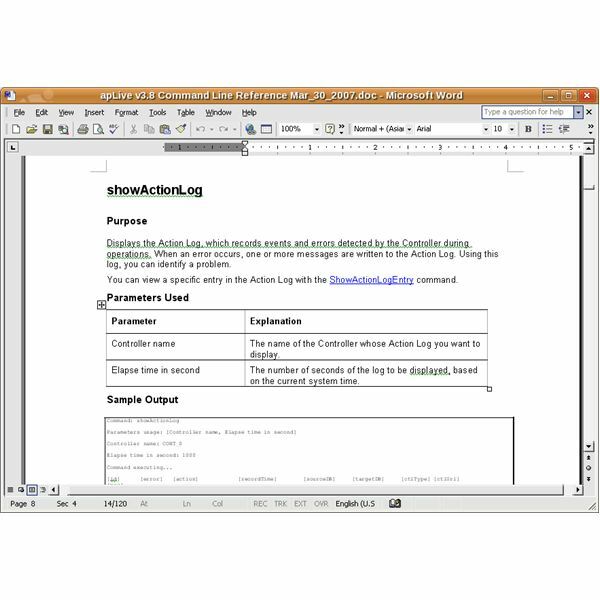 Linux has a wide range of office productivity and desktop applications, including the powerful LibreOffice suite. Unfortunately, Microsoft and other proprietary manufacturers make it difficult for free and open source software implementations to fully support all of the features of robust Windows applications. Using CrossOver from CodeWeavers, you can emulate necessary Windows applications so you can still run GNU/Linux and operate in an open source environment. Additionally, CodeWeavers provides a second product, CrossOver Games, that is capable of running a number of Windows games in a high performance environment. CrossOver Linux is a commercial application that's based on Wine. Wine is an Open Source tool that provides a layer between a Windows application and Linux which tricks the application into believing that it's running on its native operating system. In true Open Source spirit, CodeWeavers turns its code over to the Wine Project. You can download a 30-day trial of CrossOver Linux. There are installers for various flavors of Linux. I usually get the Loki installer, which essentially wraps the installation program in a shell script. Once you've downloaded the software, just run the installer. A graphical wizard guides you through the installation. It's quick and it's easy. The installer also adds a new item to your applications menu — for example, Applications > CrossOver in GNOME. Again, this is very simple. A wizard guides you through the process. Just select Applications > CrossOver > Install Windows Software. You can select from a list of Windows software that's know to work seamlessly with CrossOver (more on this in a moment). Or, you can install what CrossOver deems unsupported software from a CD, a USB drive, or your hard drive. Most Microsoft Windows applications will run best using the Windows XP option, though more current software may require the Windows Vista or Windows 7 mode to function properly since the Windows operating system went through a major overhaul between Windows XP and Windows 7. 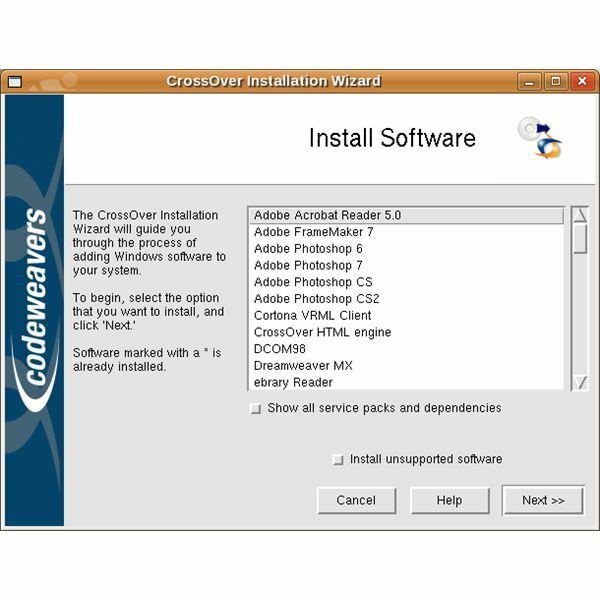 CrossOver runs the installation program for the Windows application. If the installation is successful, it's added under a new menu called Windows Applications. There are a core set of Windows applications that CrossOver supports. These include Microsoft Office, Adobe Acrobat Reader, Photoshop, certain versions of Quicken, Windows Media Player, and Lotus Notes. Often, though, the most recent versions of these applications aren't supported. Compatibility with other software varies — check the CodeWeavers Web site for details. Some software that you try to install will work. Some of it won't. I tried installing the latest version of a publishing program called FrameMaker. The installer seemed to run, but when I tried to launch the program nothing happened. Other than that, if the software requires .NET or Java to run, it won't install. For applications that don't have an installer (for example, a single executable), you can run it by opening your file manager and find the .exe file. In Nautilus, for example, you run an application by right clicking on the file and choose Run with CrossOver. In most cases, very well. Some software runs as smoothly with CrossOver Linux as it does in Windows. I have Word 2003 installed on my laptop and it starts as quickly as on a comparable computer running Windows. Sometimes, though, strange things happen with a program's interface. You can't resize windows, or the edges of the interface are transparent. There can be some other strange behavior, too, like fonts not rendering properly or tool bar icons being distorted. 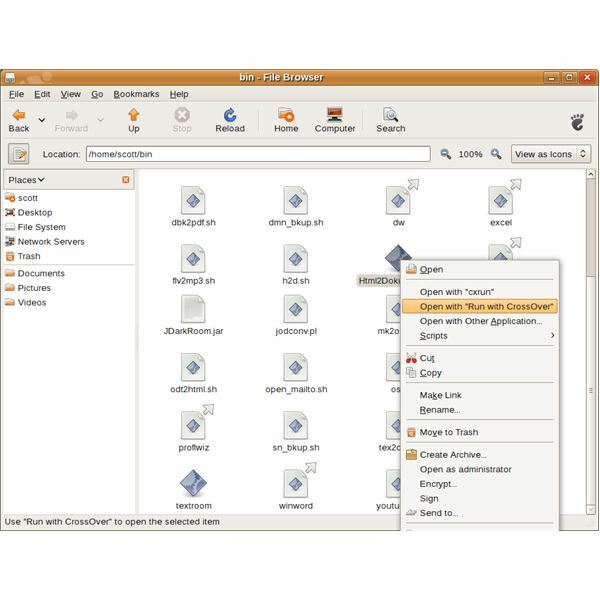 CrossOver Linux offers a relatively seamless and easy-to-use way for Linux users to run Windows applications on their desktops. You don't have to resort to any other trickery, or use the command line as you would with Wine. The main drawback for some is the price. But if you absolutely have to run a Windows application and don't want to mess with Windows then CrossOver Linux is definitely worth the price. Since the original publication of this article, the Wine project has come a long way in supporting Microsoft Windows applications and may even be a better alternative to CrossOver. 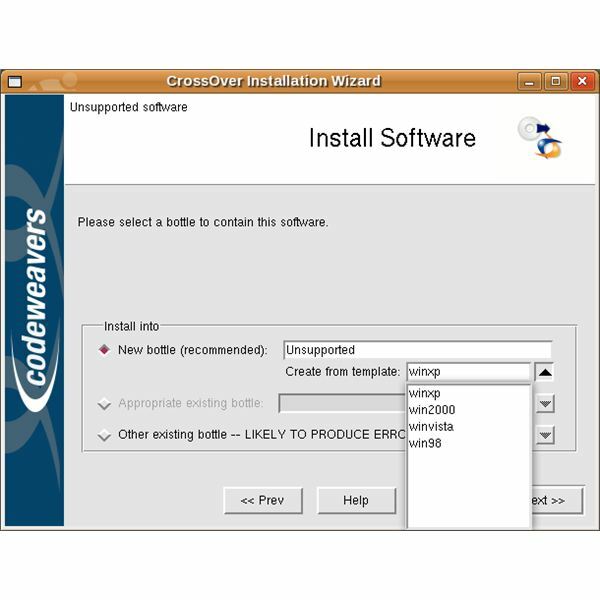 Test running any necessary applications in the free and open source Wine first before purchasing CrossOver for Linux might be your best option.